My second post of the day. I have to share my exciting news!! 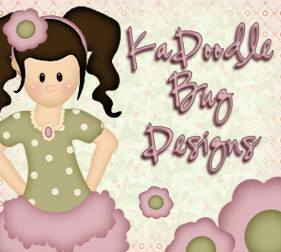 I'm SO excited to announce that I've been selected to be on the KaDoodle Bug Designs team!!! I'm such a huge fan of Melissa's patterns and very honored to be part of her team. Woo Hoo!! Lots more to come I'm sure. Make sure you "like" KaDoodle Bug Designs Facebook page and visit KaDoodle Bug Designs so you don't miss any the sales, weekly freebie, surprise freebies, challenges and design team projects! I thought this set was so cute. I love the faceless clipart at KaDoodle Bug Designs! I did a print and cut, stamped the PKS faces added some embellishments and it was done!! That simple. Did you notice I did some sewing? I just bought a new sewing machine. I haven't sewn since the 9th grade but I'm figuring it out. Tea Time is from Cardz TV Brew Ha Ha! Congrats ladies! Please send me an email. Tara, Congrats to you! You are going to do a fabulous job! Their designs are super cute and so is your card! Nice job on the stitching - looks fab! Wow..fabulous card! Love the sweet designs and the PK faces are just adorable! I just started checking out and picking up a few things over at Kadoodle Bug Designs..super cute stuff! Can't wait to see more of your creations! Yiippee!! I am Super Happy excited for you!!!! Your card is adorable!!!Oh! Congrats on the stitching, Awesome job!! Congrats on making the Design Team I am so happy for you. I love all the great SVG she has and her freebies are totally cute.! Congratulations on your new DT gig, Tara! I am a big fan of your work and so glad for you!! Yay for you Tara! I LOVE Kadoodle Bug Designs! That is an awesome DT to be on!! :) Can't wait to see your wonderful creations. Congrats Tara on your new DT!!!!! Your card is super adorable and I can not wait to see more!!!!! Congratulations Tara!! Love your card! Congratulations my friend!!! Your first card is beautiful!!!! Cannot wait to see what you do with their cut files!! Congrats Tara. How exciting. Your card is too cute. Congrats to all the winners. Have a creative day. BIG CONGRATS to a very talented sweet crafter! Good luck and make them proud!